Although the pharmacokinetics of dexmedetomidine in healthy volunteers have been studied, there are limited data about the pharmacokinetics of long-term administration of dexmedetomidine in critically ill patients. This population pharmacokinetic analysis was performed to quantify the pharmacokinetics of dexmedetomidine in critically ill patients following infusions up to 14 days in duration. The data consisted of three phase III studies (527 patients with sparse blood sampling, for a total of 2,144 samples). Covariates were included in a full random-effects covariate model and the most important covariate relationships were tested separately. The linearity of dexmedetomidine clearance was evaluated by observing steady-state plasma concentrations acquired at various infusion rates. The data were adequately described with a one-compartment model. The clearance of dexmedetomidine was 39 (95 % CI 37–41) L/h and volume of distribution 104 (95 % CI 93–115) L. Both clearance and volume of distribution were highly variable between patients (coefficients of variation of 62 and 57 %, respectively), which highlights the importance of dose titration by response. Covariate analysis showed a strong correlation between body weight and clearance of dexmedetomidine. The clearance of dexmedetomidine was constant in the dose range 0.2–1.4 μg/kg/h. The pharmacokinetics of dexmedetomidine are dose-proportional in prolonged infusions when dosing rates of 0.2–1.4 μg/kg/h, recommended by the Dexdor® summary of product characteristics, are used. Dexmedetomidine is a highly selective, lipophilic α2 adrenoceptor agonist . It is used as a sedative agent in intensive care and can be considered an alternative to more traditionally used midazolam and propofol, which act by potentiation of GABAA receptors. Compared with other sedatives, dexmedetomidine does not depress respiration in healthy volunteers  and results in better cognitive function than propofol in intensive care unit (ICU) patients , allowing better patient arousability and interaction [4, 5], and possibly earlier extubation . The pharmacokinetics of dexmedetomidine have been previously studied in healthy volunteers [6, 7, 8], post-operative patients , renal disease patients  and intensive care patients [11, 12, 13, 14]. Dexmedetomidine is mainly metabolised by direct glucuronidation , which is a high-capacity pathway and has a high hepatic extraction ratio of 0.71 . We are aware of two studies, which involved a total of 34 patients, concerning the pharmacokinetics of long-term dexmedetomidine in doses higher than 0.7 μg/kg/h [11, 12]. In this paper, pharmacokinetic data from three phase III clinical trials with more than 500 critically ill patients were used to evaluate the impact of a variety of covariates on pharmacokinetics of dexmedetomidine and to confirm the results of the two previous studies in a larger patient group. A further objective was to investigate the dose proportionality of dexmedetomidine pharmacokinetics. For this population pharmacokinetic study, the three phase III studies of prolonged dexmedetomidine treatment in critical-care patients sponsored by Orion Pharma were analysed, including MIDEX (Midazolam vs. Dexmedetomidine) and PRODEX (Propofol vs. Dexmedetomidine) studies [5, 16] (ClinicalTrials.gov identifiers: NCT00226785, NCT00481312, NCT00479661). The studies were conducted according to Good Clinical Practice standards and in accordance with the Declaration of Helsinki, subject to ethics committee review and informed consent obtained for all patients according to local regulations. Patients who subsequently withdrew consent were not included in any analyses. No new data were generated during the current study and thus further ethics approval was not required. All studies included adult patients who were initially intubated, mechanically ventilated and expected to require light to moderate sedation for at least a further 24 h. The main exclusion criteria were (1) acute severe intracranial or spinal neurological disorder due to vascular causes, infection, intracranial expansion or injury; (2) uncompensated acute circulatory failure at time of randomisation (severe hypotension with mean arterial pressure <55 mmHg despite volume and pressors); (3) severe bradycardia (heart rate <50 beats/min); (4) atrioventricular-conduction block II–III (unless pacemaker installed); (5) severe hepatic impairment (bilirubin >101 μmol/L); (6) burn injuries and other injuries requiring regular anaesthesia or surgery; (7) use of centrally acting α2 agonists or antagonists (e.g. 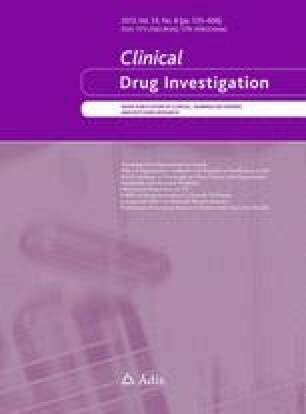 clonidine, titzanidine, apraclonidine and brimonidine) within 24 h prior to randomisation; or (8) investigators’ own judgement. The patients received an initial infusion of 0.7 μg/kg/h for 1 h. Thereafter, the dosing was titrated to clinical effect to maintain patients in the pre-defined target sedation range (Richmond Agitation and Sedation Scale 0 to −3 in all cases) using fixed dose levels ranging between 0.2 and 1.4 μg/kg/h. The maximum duration of treatment was 14 days. Blood samples were taken at the following times: baseline, 1 h (±15 min) after starting study treatment and every day at approximately the same time until the end of study treatment. Additionally, two follow-up samples were taken at 24 and 48 h after the end of study treatment. Concentrations of dexmedetomidine in EDTA plasma samples were determined with high-performance liquid chromatography–tandem spectrometry (HPLC-MS/MS; Shimadzu Prominence HPLC, Kyoto, Japan) and mass spectrometric detection (AB Sciex API4000 mass spectrometer, Toronto, ON, Canada), as previously described . The lower limit of quantification was 0.02 ng/mL. The within- and between-run precision of the assay (coefficient of variation) was within 7.5 % in the relevant concentration range. Deuterated medetomidine was used as the internal standard. As part of the safety monitoring, the values of aspartate aminotransferase (AST), alanine aminotransferase (ALT), bilirubin, creatinine clearance  and albumin were measured at baseline and on days 2, 4, 6, 9 and 14 after start of study drug infusion, and at 48 h post-dose. The baseline values of these markers were used for each patient as predictors of dexmedetomidine pharmacokinetics. If no baseline data were available for a patient, the average of all measurements from that patient was used. If no measurements from any time point were available for a patient, the median value of the whole population was substituted for the covariate value of that patient. Data were analysed using the NONMEM® software (version 7.2; ICON Development Solutions, Ellicott City, MA, USA)  with Intel Visual Fortran 11 compiler and Perl-speaks-NONMEM . The model was fitted to data using the stochastic approximation expectation/maximisation algorithm , with 5,000 burn-phase iterations and 2,000 accumulation-phase iterations. The standard errors were calculated with importance sampling , using 20 iterations with 3,000 samples per subject and two degrees of freedom because of the sparseness of the data. One-compartment and two-compartment models with first-order elimination were tested before the inclusion of covariates to describe the time–concentration data. where P i is the parameter value of the ith subject, θ pop is the typical (median) value of this parameter and η is a random variable with mean of zero and variance of ω 2. Residual error was implemented as a combination of additive and proportional residual errors. A full random-effects covariate model was used to quantify the relationship between pharmacokinetic parameters and covariates . Briefly, a full random-effects covariate model uses random effects to both quantify the variability in pharmacokinetic parameters and to describe the individual values of observed covariate values. The covariate values are included in the dataset as observations. A full covariance matrix is estimated for the random effects, which means that the correlations between pharmacokinetic parameters, correlations between covariates, and the correlations between pharmacokinetic parameters and covariates are estimated. Advantages of this approach are that (1) it is not sensitive to correlated covariates, which means that all potential covariates can be included in the model; and (2) it may be more stable than a covariate model based on fixed effects. The full random-effects covariate model was considered the most appropriate approach for this project because many of the covariates were correlated. Furthermore, the dexmedetomidine dosing is based on dose titration by response. Because of this, there was considered to be no need to provide dosing guidelines based on covariates, unless dramatically altered pharmacokinetics could be associated with any single covariate. The following covariates were included in the model: body weight, age, creatinine clearance, AST, ALT, bilirubin and albumin. Log-normal distributions were used to describe the between-subject variability in covariate values. Prognostic indicators such as Simplified Acute Physiology Score (SAPS) were not applied in all studies and so could not be used as a covariate. where COV i is the individual value of the covariate, COV std is the reference value of covariate, and θ exp is an estimated parameter signifying the relationship between the covariate and the parameter. This way, p-values could be calculated for the significance of the covariates by comparing objective function values. The difference in objective function values between nested models is chi-square distributed. The estimation method used in this step was QRPEM  using 80 iterations with 3,000 samples per subject. A subset of the whole dataset was used for an additional analysis of steady-state concentrations (C ss). Based on previous work , samples taken from patients after 15 h (five half-lives) of continuous infusion with a constant infusion rate (R inf) were considered to be at steady state. From these samples, the linearity of dexmedetomidine pharmacokinetics in doses up to 1.4 μg/kg/h was assessed. Briefly, the analysis consisted of calculating the clearance (CL) of dexmedetomidine based on these single observations, and plotting the calculated CLs against R inf. The C ss of a drug are dependent only on R inf and CL of the drug (Eq. 3) . Therefore, the CL of the drug can be calculated as the drug R inf divided by the C ss of the drug. The observed CL versus R inf was plotted and a linear model was fitted. The main interest was whether the slope of CL, as a function of R inf, is different from zero. If the metabolism of dexmedetomidine became saturated at higher doses, then a negative trend would be visible in the plot of CL versus R inf. A total of 527 patients were included in the study. The overwhelming majority (96 %) of patients were Caucasian. The mean age (± standard deviation) was 62 (±15) years and there were more males (65 %) than females in the study population, which is typical of ICU settings . Other relevant demographic factors have been summarised in Table 1. A total of 21 covariate values were missing, and population median values were substituted in their place. There were a total of 2,144 dexmedetomidine concentrations above the limit of quantification available in the dataset. Figure 1a presents the number of samples taken after different R inf. In total, there were 47 plasma samples taken during dexmedetomidine infusion, which contained dexmedetomidine concentrations below the limit of quantification. Furthermore, 95 % (n = 458) of the samples taken at baseline, and 72 % (n = 634 out of 875) of the samples taken at 24 and 48 h after end of infusion, were below the limit of quantification. Samples below the limit of quantification were excluded from the analysis (M1 method introduced by Beal ). The M3 method, which consists of treating the samples below limit of quantification (BLQ) as censored and maximising the likelihood for them being censored, was also tried. The M3 method resulted in similar parameter estimates [less than 1 % difference in population estimates of CL and volume of distribution (V d)], but the NONMEM® software failed in calculating the standard errors of parameters when the M3 method was used. Therefore, the M1 method was considered the most appropriate method for treating the BLQ observations. Some atypically high concentrations of dexmedetomidine were encountered. The highest concentration was 383 ng/mL. There were four other unexpectedly high concentrations: 89, 82, 56 and 48 ng/mL. These samples were reanalysed and the same results were observed. These outlier concentrations occurred in four distinct patients, and they were mostly not preceded nor followed by atypically high dexmedetomidine concentrations. One possible explanation for the high concentrations encountered is that the blood sample could have been taken downstream from the study drug infusion, for example from the same arm. To test this hypothesis, a semi-quantitative metabolite analysis was made for all samples of all the individuals from whom dexmedetomidine concentrations higher than 30 ng/mL were observed. The analysis showed no increase in metabolite concentrations during or after the high dexmedetomidine concentrations (data not shown). Based on this evidence, it seems that these high dexmedetomidine concentrations were not likely to reflect the true venous concentrations in patients and the concentrations were excluded from the model-building process. The final model was run both with and without these concentrations and both results are reported. Figure 1b presents the time–concentration data for all individuals without the concentrations above 30 ng/mL. The numbers of blood samples per patient are summarised in Fig. 2a. The average duration of treatment was 2 days 14 h. The treatment durations of the patients are summarised in Fig. 2b. Dexmedetomidine time–concentration data were best described with a one-compartment model. Although the two-compartment model resulted in a decreased objective function value (p < 0.001), the parameter values were highly dependent on initial estimates and resulted in implausible results, such as the distribution half-life ranging between 32 s and 1.5 h depending on the run. The previously reported distribution half-life of dexmedetomidine is 6 min [8, 9], and the blood sampling in the current study was sparse. Therefore, the data were not considered adequate to identify the parameters of a two-compartment model, and the one-compartment model was chosen. The typical CL of dexmedetomidine was 39 L/h and V d 104 L. The final model (with and without outlier concentrations) parameter estimates and standard errors are presented in Table 2. The inclusion of outlier concentrations had little impact on the estimates of CL (38 L/h) or V d (108 L). However, there were increases in between-subject variability and standard errors of estimates when the outlier concentrations were included. The observations versus model predictions are shown in Fig. 3a, b. The correlations between pharmacokinetic parameters and covariates are reported in Table 3. The strongest correlation (31 %) was found between body weight and CL; other covariates with higher than 10 % correlation to CL were AST and bilirubin (both with inverse correlation). Only albumin had a correlation to V d that had a relative standard error less than 100 % (inverse correlation of −12.7 %, standard error of 9.41 %). When body weight was included as a predictor of CL into the base model, there was a significant improvement (p < 0.001) in the model, and the estimate of θ exp was 0.76, indicating an almost linear relationship. AST and bilirubin were also significant predictors of CL (p < 0.01 and p < 0.05) and their respective estimates of θ exp were −0.067 and −0.091. Albumin was a significant predictor of V d (p < 0.001) with an θ exp estimate of −0.49. Table 4 presents the predicted changes in CL and V d for the 2.5th and 97.5th percentiles of the covariate values. A total of 643 observations (out of the 2,144) at R inf equal to or below 1.4 μg/kg/h were included in the analysis of C ss (Fig. 4a, b). One steady-state sample was considered an outlier and excluded because of being over 30 ng/mL. The calculated CLs versus dexmedetomidine R inf are presented in Fig. 4c. Although the linear model estimated a CL slope significantly different from zero (p < 0.05), the estimate of slope was slightly positive. Based on this, the CL of dexmedetomidine does not decrease at higher doses, and it seems that no saturation of metabolism is evident in continuous dexmedetomidine infusions up to 1.4 μg/kg/h. The parameter estimates obtained from this study are similar to previous findings in both healthy volunteers and ICU patients. The CL estimate was 39 L/h in this study. A range of CLs between 31 and 53 L/h has been reported in previous studies in healthy volunteers [6, 7, 8, 10], and a range of 28–57 L/h in intensive care patients [11, 12, 13, 14]. The lowest CL values (28 L/h) were reported in Chinese intensive care patients. One possible reason for the small CL estimate in that study is that the mean body weight of patients in that study was 60 kg . The V d was estimated to be 104 L in this study, which is slightly lower than the V d at steady state (V ss) values between 121 and 194 L that have been reported in healthy volunteers [7, 8, 10]. In intensive care patients, V ss values between 123 and 389 L have been reported [12, 13, 14] and the reason for the lower value in this analysis is not clear. The strongest covariate relationship was between dexmedetomidine CL and body weight. Some markers of hepatic dysfunction, such as high levels of AST and bilirubin, were associated with decreased CL. This is in agreement with previous knowledge, since hepatic impairment has been reported to result in decreased dexmedetomidine CL  and lower initial doses of dexmedetomidine should be considered in patients with hepatic impairment. An inverse association between plasma albumin and V d was also found. This was expected, since dexmedetomidine is 93 % bound to plasma proteins . Therefore, lower concentrations of albumin cannot bind dexmedetomidine into the blood as effectively, which may drive dexmedetomidine into other tissues. However, the inclusion of these covariates as predictors of dexmedetomidine pharmacokinetics resulted in minimal decrease in between-subject variability (Table 4). No signs of decreasing CL with higher dexmedetomidine concentrations were found by the analysis of C ss. This result is in contrast with recently published work, where dexmedetomidine was found to decrease cardiac output and cardiac output was found to affect the CL of dexmedetomidine . In that study, the dexmedetomidine concentration to produce 50 % of maximum decrease in cardiac output was estimated at 2.4 ng/mL, and R inf of up to 2.5 μg/kg/h were used, which resulted in overall higher dexmedetomidine concentrations than those observed in the current study. It may be that the current study could not quantify a decreased CL resulting from decreased cardiac output because the average dexmedetomidine C ss of 2.3 ng/mL (Fig. 3a, b) after the highest R inf of 1.4 μg/kg/h were lower than the dexmedetomidine concentrations required to produce 50 % of maximum effect on this variable . Although cardiac output data were not collected in these studies, one might speculate that within the usual dose range (0.2–1.4 μg/kg/h) the range of concentrations observed is not sufficient to demonstrate this pharmacodynamic relationship clearly. A total of five concentrations above 30 ng/mL were observed, and considered as outliers. In the current study, the data were analysed both with and without the outlier concentrations. The presence of outlier concentrations in dexmedetomidine pharmacokinetic studies has been documented and discussed in previous studies [26, 27], and a Bayesian mixture model has been published solely for the handling of outliers . In these data, both intra-individual and inter-individual variabilities were high, which is likely to reflect the highly variable physiological and medical condition of ICU patients. For example, the hepatic blood flow is temporarily reduced after injury , which might affect the CL of dexmedetomidine. Decreased cytochrome P450 enzyme activities have been reported in hepatocytes exposed to cytokines  but, to our knowledge, no similar experiments have been reported for glucuronidation enzymes, which are in this case more relevant since dexmedetomidine is mostly metabolised by direct glucuronidation . It should also be mentioned that ICU patients are subject to many concomitant medications and the medications may change over time, which could impact pharmacokinetics of dexmedetomidine. For example, 63 % of the patients were given vasopressors or inotropes (Table 1), which could affect hepatic blood flow. Since dexmedetomidine is a high extraction ratio drug , changes in hepatic blood flow and cardiac output are more likely to affect CL than are changes in liver enzyme activity. Since most of these changes in ICU patients are time-dependent, they contribute both to intra-individual and inter-individual variability. For a more extensive discussion of pharmacokinetic alterations in ICU patients, several reviews are available (see, for example [30, 31]). There was some missing covariate information. The approach taken in this study was to substitute median values for missing information (see Sect. 2.5). This approach is conservative and may increase the risk of false negative findings (type II error) while decreasing the risk of false positive findings (type I error). However, in this case less than 1 % of covariate records had to be substituted with a median value of the covariate. This population pharmacokinetic study features the largest patient population in a dexmedetomidine pharmacokinetic study to date. Because of the sparse blood sampling, a one-compartment had to be used to describe the pharmacokinetic data, although a two-compartment model would be necessary to describe the concentrations during the first minutes after change of R inf. However, the estimate of CL should be accurate despite the use of a one-compartment model, since samples typically were not taken shortly after change in study drug R inf (data not shown). Despite the simplicity of the structural model, the large number of patients provides a good basis for covariate analysis. In conclusion, based on C ss analysis, no saturation of dexmedetomidine metabolism occurs at dexmedetomidine doses up to 1.4 μg/kg/h and infusions lasting up to 2 weeks. Body weight is an important, intuitive and easily available predictor of dexmedetomidine CL. Other statistically significant covariates were also identified, but they are not as easily available and did not result in a clinically important decrease in inter-individual variation and so are not suitable for determining appropriate individual patient dose. Therefore, based on the results of this study, dexmedetomidine should continue to be dosed by body weight with titration according to clinical response. We gratefully acknowledge the Dexmedetomidine Investigators for conducting the clinical studies, Lauri Mantere for compiling the datafile and Petri Toivanen for helpful discussions about statistical modelling. This pharmacokinetic analysis is an extension of work done for Orion Pharma during December 2009–December 2010 and February 2011–March 2011, during which time all authors were Orion Pharma employees. The study was sponsored by Orion Pharma; this involved the design of the study, collection of the data and formatting the data into a format suitable for pharmacokinetic analysis. Orion Pharma is the manufacturer and Marketing Authorisation holder of dexmedetomidine in the European Union.